I wrote this poem for Caden a few years ago. Maybe it best sums up why I continue to spend so much energy on Autism Awareness each and every April. No matter who or where you are in life, watching your child struggle is difficult. In the moment of those tears and struggles, you don't care about the politics surrounding an official diagnosis or even what official name the struggles are being given. You want, as a parent, to help your child find happiness. Sometimes though the problem is that we are using our own perceptions to define happiness for another person; sometimes finding happiness means trying to look at the world through your child's eyes. There's a time and place for therapy and services but there's also something very real, very necessary, and very special about relating to your child at whatever point they are at in a way that they understand and communicate. I've learned so much about the world since I started trying to see it through Caden's beautiful blue eyes. You might know this guest blogger as Calormom on Twitter. She is one of my best friends and I am so honored to be having Tracy Miranda sharing her son's experiences of living on the spectrum. Tracy is a loving mother, wife, school employee, volunteer in her son's classroom, and consultant for Origami Owl. April is always a difficult month. Every year there is a new hope that the autism community will come together and shed new light on our cause. Yet, every year there just seems to be more fighting and less understanding. Pro vaccine vs anti vaccine, awareness vs acceptance and even fighting over the color blue and the puzzle piece. I wanted to write an inspiring piece about how we need to respect each other and how our opinions are our own. I have to believe that no matter who chooses to support what, at the end of the day each parent believes they are doing whatis best for their child. Who am I to argue? I decided instead to write about a different kind of inspiration. My son and his best friends who are changing minds about autism every day. When we first received Conor's diagnosis it was the month before his third birthday. He had been in early intervention since he was 20 months old due to speech and fine/gross motor delays. He went five days a week for over a year before he received his diagnosis as he was getting ready to transfer into the school district. He was then in a pre-k class for a year and a half. He learned a lot and made big improvements. He spent the first year playing next to the other kids but didn't interact with them much. At recess he would walk the perimeter of the play yard and never try to play a game with other kids. When he became more verbal he could name the kids in his class, but didn't play with them much. There was one exception, a girl named Bella. They often stuck together and tried to play together on play dates. But she was a year older, a little more advanced, and it was obvious he didn't really know how to play yet. He followed her around a lot and it was the first time we saw a connection to another peer. They would hold hands, dance together, run, play and she would try to sneak a kiss now and then. Since she was older, she moved on to kindergarten and they saw less and less of each other. She has since moved out of state so they don't see each other, but they still love seeing each other's pictures and hearing stories about how they are doing. He had made so much progress in his pre-k class that the next year he transferred to a special day class in our district specifically for high functioning kids with potential to mainstream. It was there that he met the friends that would change his life, Eli and Lilly. Eli had actually been in the same early intervention program as Conor for a few months. However, neither of them had the skills to be friends back then, so it was almost like they were meeting for the first time. After school when we picked the kids up, the other parents and I soon realized this was something special. We planned a couple play dates and the kids always had a blast. We used to marvel at their progress when we watched their friendship blossom. None of them had ever connected to other children like this before. That first school year, they did so much together. We had more play dates than you can count. They went to the zoo, went on hikes, went to restaurants and went swimming. They went to the pumpkin patch, celebrated Hanukah, Christmas, birthdays and saw the the Easter bunny. All the while, sharing laughs and making memories. Last summer our families went on a weekend vacation together and the kids had the time of their lives. We stayed at a vacation home of a friend of mine. The kids had been talking about having a sleepover and we told them they were a little too young still. This was the best of both worlds. The kids got to dance in their pajamas together and have movie night, yet still sleep in their separate rooms. It was a magical trip. This past September Conor and Lilly moved on to kindergarten and Eli just missed the age cut off. We were worried that Eli would be devastated that his friends wouldn't be in his class anymore but he has thrived. Conor and Lilly are trying to make new friends but they do struggle. They don't know what to say or how to act. One of Conor's classmates came up to me one day and said "Conor's being mean." I told her that Conor doesn't really know how to be mean and asked what he had done to her. As it turns out, she was upset because he told her she couldn't climb up something and, since she could, she didn't like his remark. All of them have some trouble connecting to their neurotypical peers. If he had said that to Lilly, she would have told him he was wrong, and then shown him. She wouldn't have thought another thing of it. The connection between these three friends is undeniable. There is a level of comfort and understanding they have with each other that can't be duplicated. They all have sweet dispositions and love to be silly. The three of them have made such memories that I know will last a lifetime (and not just because their autism gave them ridiculous memory skills). We still have play dates as often as possible and their bond has never been stronger. We recently went back to see the Easter bunny and it was the first time in a little while that all three of them had been together at the same time. They hugged each other, danced and played, and walked through the mall holding hands. I wanted to share their story because I want to give hope to those who may need it. Here are three children on the spectrum who are proving people wrong. They have a bond like siblings; they fight and love like brothers and sister. They do love to push each other's buttons and can certainly make each other mad. None of them have siblings of their own, so we feel that's one of the reasons this friendship bond is so strong and important. They are learning that sometimes one of them needs a moment to be alone, and that's ok. They are learning to ask how to help each other when someone is hurt or when they are upset. They have empathy and genuine love for each other. They are learning to share, take turns and compromise. They are learning that time apart doesn't diminish their bond. They are proving that autism doesn't define them. The friendship they have is easy, when so many things in their lives are hard. I love Eli and Lilly as if they were my own kids. I hope this is the beginning of a lifelong friendship. I think they're off to a great start. Today's guest blogger Melissa O'Connell Timmer is a beautiful and talented individual whom I have had the fortune of calling friend for many years. She is a devoted wife and inspirational mother to son Brycen who is on the autism spectrum and daugher/dancing diva Aubree. In her "free" time she volunteers at her kids' school and works hard year long to raise thousands of dollars for Autism awareness. April…the month of the year that many in the Autism community choose to refocus on what is our individual mission within this spectrum. Some parents/individuals focus on raising awareness. Some focus on acceptance. Some want to go off the radar for a while. Our family chooses to just continue what we do all year long! Give our son the best life we can and help him gain the skills we feel is important for him to life his life to the fullest. One of the skills we choose to focus on the most right now is building peer relationships and helping Brycen learn how to play & interact with his peers. Brycen is blessed to attend a school that encourages integration between the children with special needs and their typical developing peers. Brycen & I are even more blessed that the last couple years there is an amazing little girl at his school that has given him a boost in this area. Brycen & Shealin met a couple years ago at the beginning of 1st grade. They were assigned to the same general education class. Even though Brycen only spent part of his day in that classroom environment, it was obvious the relationship that was budding between the two of them. As the year continued, the teachers/associates included Shealin more into Brycen’s day by encouraging her to be a “peer mentor” to him. Brycen is nonverbal & uses a communication device throughout the day. He also can be aggressive at times when he doesn’t know how to communicate or gets overwhelmed & overstimulated. Shealin understood all of this at the tender age of 6 years old & accepted him for who he was. It worked out so well for both, that at the end of the year the team unanimously decided it was best to put them in the same 2nd grade class as well to help Brycen with the transition. I don’t think any of us could foresee how this young friendship would grow into something even some adults don’t have in their life! As 2nd grade progressed, other students & teachers came to realize there was not a Brycen in the general education classes without a Shealin with him. Two peas in a pod, the ying to his yang, etc. When Brycen is upset, he tends to be aggressive to those he is most comfortable with. Shealin is no exception to that. Yet, she doesn’t get upset with him like many other peers & adults do. She states how she feels when he hits her and moves on, never judging him, accepting that this is sometimes too hard for him to control. Shealin knows how to work Brycen’s communication device almost as well as the teachers/associates with him. She understands that he doesn’t play the way the other 2nd graders will at recess, and is eager to run around with Brycen in the way he knows how to play. She can tell the signs of when he is getting frustrated and immediately reaches in to hold his hand, give him a squeeze to help him through, or just whisper to him that it will be ok.
Their relationship has progressed outside of school as well. Brycen & Shealin are the true definition of best friends. Shealin is the friend that EVERY child deserves, whether they have a disability or not. Shealin has a heart of gold, wisdom beyond her years, & never-ending patience. When Brycen & Shealin are together, there isn’t “Autism” in the equation. Shealin is an amazing young girl that many older children & adults should strive to be like. She is not only Brycen’s hero during some very rough years of his development, but she is MY hero as well! If you are reading this blog post, I hope & pray that your child can have the relationship of a lifetime like Brycen & Shealin have! I encourage you to talk to your child’s school & discuss implementing a peer mentor program like we are working towards at Brycen’s school for all children with special needs. Not only is it a benefit to your child…but it’s a benefit to the peers who will be taught acceptance & understanding of those who may be a little different than them. Let’s move into a new mission and focus on our children! This is a snippet of the conversation we recently had with the psychologist who heads Caden’s autism therapy team. The “it” was autism and the “he” was obviously Caden. I think she was a little surprised that we were so open about everything in front of him, but then again it is also possible that nothing surprises her about our household anymore. 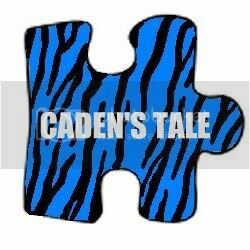 Caden knows he has autism and an immune deficiency and allergies and so on. He can’t give you a medical definition, although he can usually give you a body part if you ask—so autism will usually refer to his brain or head, allergies to his mouth and throat, etc. He can even tell you which body part each medicine he takes helps, although he doesn’t know them by name, only by color and if he chews it, drinks it, or inhales it. Oh, and he does call the lactulose “poopsy medicine,” which is technically true, but also illustrates that he understands all of this on his level. And that’s how we intend to keep things. He knows that we go to the hospital every 28 days because his body isn’t very good at fighting germs, but he also knows that his body is really fast when it comes to running and jumping. He knows that Elf is an autism service dog and gets to go to school with him for that reason, while other people’s dogs have to stay home. He knows that some days he has to come home early to do autism therapy, and that autism is the reason he has a lot of challenges with reading, talking, emotions, etc . He also knows, though, that he has a pretty special dog and bracelet (Project Lifesaver) because of his autism, and that his autism makes him really, really good at video games, math, and not giving up on anything. We keep the conversations around him natural, on his level, and answer questions when he has them no matter how big or small. He also knows that he can stop the conversation if he doesn’t want to talk about it at that moment. I suppose if I am honest I started this approach with Ryley because I was a single parent taking her to doctor appointments; there simply wasn’t anyone to sit with her in the waiting room while I talked to the doctor so she heard what was discussed. Because I didn’t want her scared or confused by what she was hearing, I started asking her if she had questions and usually she did. When she was younger, it was usually along the lines of if it was sticker (something little) or balloon (something big) worthy. As she has gotten older, she asks some pretty hard-hitting questions about risks and recovery and long term outlook. In fact, last summer as the doctor tried to skim past the material being used to replace her ear cartilage during surgery, she stopped him to ask some very specific questions about the donor process. Since the approach works in our medical world, we just carry it over into everyday life. We don’t have a lot of secrets from the kids, and we work most challenges out with their involvement. There are topics that simply aren’t up for discussion—things like wearing seatbelts, taking medicine, or other life/death issues. But we don’t uphold a double standard either—they wear seatbelts, we wear seatbelts and so on. Things that we can do that they can’t, we explain in plain and simple terms, and they generally get it. When we can, we give them power to make decisions and take control. Caden needs his Project Lifesaver bracelet for safety reasons, but he can be empowered to help us check the battery every morning. He has to take all of his medications, but he can pick which one he takes first, second, and so on. Surgery isn’t discussable, but Ry can help us figure out when in the schedule will safely and most conveniently work with her school or dance schedule. And this is all age and maturity level appropriate. Ry doesn’t like secrets, and needs to be prepped ahead of time particularly for anything medical; we talk to her as soon as we know something, and we help her find more information if she wants it. Caden, on the other hand, just gets anxious with too much lead time so we prep him the day or night before. All of this is a conversation; we share information, we answer questions, and we legitimize feelings. It’s okay in our house to get mad about an illness or a condition as long as it doesn’t become paralyzing. Recently, Ry became very caught up in her new medical challenges, and was having a hard time finding her perspective again; we found some kids her age with similar conditions for her to talk to and it really helped. Sometimes the conversation needs to happen, but maybe a peer or someone going through it understands better than mom or dad. We know that having a sibling with autism isn’t easy, and that she has feelings she probably isn’t comfortable venting to us, so again we’ve found peers and other adults that she can talk to. And none of this is a perfect science. Sometimes we share too much information or information at the wrong time; my daughter is famous for saying, “geesh mom I so didn’t need to know that right now.” It’s really hard to gauge what Caden does and doesn’t understand so we do a lot of backtracking and fixing, but at the same time I feel better knowing that words like autism and immune deficiency can be spoken in front of our kids without shame or embarrassment. They are just facts in our family--a part of who we are. And I’m hopeful that if they know we are comfortable sharing with them, as they grow older and face new challenges in their lives they will be just as comfortable sharing with us. Although the questions are occasionally awkward, there’s no one I’d rather they get information from than us. Now if I can just find the answer key to life we’ll be set. BUTLER MODAFF ROAD TO CHINA ADOPTION UPDATE! We have been matched with an absolutely adorable little boy. He was born October 4, 2012 in the Henan Province. For adoption privacy reasons, I can't share his picture with you but trust me when I say he is absolutely ADORABLE! He has incredibly gorgeous big brown eyes and the most adorable smile ever; we can't wait to bring home and make him a part of our family. We are currently waiting on the next step of paperwork but are hopeful that we will travel this summer. Today's guest post is by the amazing, talented, and always humorous Cynthia Gregory who you might know from her website as CGregoryRun. Cynthia is a mother to three equally amazing kiddos and loves everyone that lives on or near the spectrum, no matter what they believe. Each April, every person in the autism community who can put two sentences together takes to the internet to spread awareness, acceptance, raise money, fight, complain and praise the accomplishments made. Sometimes all of that happens in a single article or at least in the comments. If you’re unaware of the ups and downs in the community, let me simplify it for you. We’re a big family. One in 68 people has autism and that means there are a lot of people at the holiday gathering in April. Families bicker quite a lot. We fight about causes of autism, how to treat it or whether to eradicate it or accept neurodiversity as our platform. We discuss and argue nomenclature and where money goes to research organizations and which television shows are presenting autism truthfully and respectfully while not ignoring the challenges of living on and near the spectrum. Sometimes there are even drunken brawls that end in a smearing of blue and puzzles and taupe all over the dinner table and that’s okay, because we’re still family when the month is over and fights can lead to progress. We still recognize each other wherever we go. We reach out to offer help to the new relatives on the block. We encourage each other most of the time when things are tough and you can bet your bottom dollar that if any one of our family members has a problem, we all swing into action like a well-trained special forces squadron. When we are together, we are strong and unstoppable. When I think of how I relate to everyone in April, I can’t help but remember what happened the night I graduated from college. Do you know this guy? This is Father Guido Sarducci, a character created by comedian Don Novello. It’s important that you have an idea of his accent before I tell this story. Unlike a lot of my friends, I had no clear path set up after graduating. I had no idea what I wanted to be and there I was all grown-up. I was just elated to be finished with school and my mother threw a wonderful party for me. I got wasted. At the end of the evening I was perched over the porcelain throne in my mother’s bathroom while she held my hair and laughed at me for trying to speak other languages I had learned in college. Then I broke out into Father Guido-speak. My mother had no intention of letting me off the hook, so she encouraged the discussion by laughing more and asking me where I was from. “The Middle? Where is that?”, my mom asked. Now, why in the world would that be the thing I think of when writing about April and Autism? It’s simple. For all the fussing relatives throwing puzzle pieces, lights and blue jello at each other, there are a whole lot of us that come from The Middle. We get both sides. We understand why Aunt Rita hates the puzzle piece, we agree that Uncle Ned feels a connection to blue and we find ourselves hoping the family can sit down at least one time in April and hug, or at least not throw things and make Grandma cry. Whatever you believe April should be about and how it is discussed, let’s do ourselves a favor and try harder to respect each other, listen to differing opinions and try our best not to sling food during the family portrait, for Grandma’s sake. Welcome all to Autism Awareness Month – I often wonder what that means. AWARENESS – to become conscience, to recognize, to understand. When my son was younger, shortly after we received his diagnosis of PDD-NOS (or high functioning autism for those not familiar with it), we went out to eat with a friend and her two kids. My son was having a really hard time dealing with the environment, it had been our first time there and he was running and touching things. While I was trying to calm him down, a very nice looking older man in a suit commented on my son’s behavior by saying: “you’re raising an axe murderer” to which I smiled and continued to talk to my son. That wasn’t enough for this stranger though. He continued by saying that he was serious, that he had been in the line at the bank earlier and had seen how my son was acting and how I clearly simply refuse to discipline him. Now, I need you to understand one thing: it had been maybe a month or so since finding out my son had autism, I wasn’t ready to tell my family about it, much less a stranger. By then my son was having a full-blown meltdown, I started to say something and broke down so I just grabbed him and ran outside to cry away from prying eyes. That was a very important day for me. It taught me two very important things: 1- People judge based on their own experiences and 2- I was alone in this battle for my friend never once said one word, not to me, not to the stranger who attacked me. With the many more nightmarish experiences that followed I was forced to grow a thicker skin, to educate myself; I was also more aware of my surroundings and the people in it. I used every “bad” moment as an educational moment. Fast-forward 4 years of intense SPL, OT, PT, ABA and social therapies and I am now faced with a different, yet familiar problem. My son has now entered the invisible handicap status. For a while when I told people that my son has autism they would change their entire demeanor, they’d express understanding, sometimes condolences or even pity (I’ve learned to deal with that as well). Today when I tell people my son has autism I hear “he doesn’t look autistic” (you’re lying to excuse your bad parenting), or “how is he able to understand this but not that then?” Even friends and family members have come to “forget” that he has challenges because of all the great progress he has made. What has happened to their awareness, their understanding? Don't get me wrong. I am not saying I wish his autism was more visible or that he hadn't progressed so much or so quickly, but it's a very bittersweet process for I am left lost. Sometimes I feel like I am starting to navigate Autism all over again, learning all about it from my son's point of view. To me autism awareness isn't about a day or even a month, it isn't about having people feel bad for the parents or sad for the children affected by Autism. It is simply to help others understand what it is or what it isn't. It's about breaking down stereotypes and opening doors not only for our kids but also for the estimated 1.5 adults living with ASD in the U.S. alone. Okay, I have to start with a disclaimer. Last year scarred me; there was so much fighting within the Autism community that I choose to do the absolutely worst thing for my son---I chose silence. I let the fighting and hostility verbally shut me down. I have had a year to think about and reflect upon the choices that I made last year, and I think that I am coming back in a stronger, more mentally committed place. Here’s the thing, I don’t really care if you fill the blank in with awareness or acceptance. I could honestly argue it either way. Depending on where you live, what resources you have available to you, or even where you are on the journey will greatly determine if you are in an awareness or acceptance mode. In the bigger scheme of things, it becomes a chicken and egg question. Individually, it takes a great deal of acceptance to be comfortable promoting awareness and sharing one’s own experiences and story. On the other hand, it is only through awareness that anyone moves toward acceptance. I am hopeful that the underlying intention of both awareness and acceptance is that of support. Support in being who individuals want to be as a person, support for finding resources within one’s own community, support for individuals who want to be compassionate and caring toward an individual with an ASD but don’t know how, support for family members who don’t understand why their loved one keeps wandering, support for siblings who wonder if they will ever have a playmate or a brother/sister who can verbalize their thoughts, and so on. That same notion of support is what draws some individuals toward larger, national organizations, while other individuals are drawn toward smaller, local organizations. Support is what leads some individuals to shine a light or display a puzzle piece. I have said this before, but long before I knew what the blue light meant, I associated blue with my son. I’ve written several blogs, poems, and even a song about his blue eyes; the same blue eyes that stopped making contact with us. Blue was the color of his favorite Thomas the Train toys when he was younger; the same toys that lined our living room and eventually pointed us in the direction of a diagnosis. And he has always loved lights, so for me it was natural to light a blue light when given the chance. Interestingly no one in our neighborhood has ever associated the blue light with a particular agency but I do know that they put out their blue lights to support a certain little blue eyed train loving boy in my household. Financially, I am trying, as with all of my expenditures, to support our local community, but that doesn’t diminish my love for the blue lights either. In our community, the lights make me feel supported and my son loves to find them throughout the month. At the end of the day, I don’t want to fight over what organizations we individually support, what symbols we use to represent our experiences, or what word choices we pick to describe the month. I want to share our experiences with autism, recognizing full and well that each and every experience will be as different as the individuals on the spectrum. My goal for the month is to try to take something away from each of those stories that I can in turn offer as support to someone who needs it. I’m going to write and share our experiences with the same goal in mind. April is going to be Autism Support Month in our family this year.